Password security has over the last few years become very important. As online retail has taken off, saving your purchase details requires you to choose and remember a password to secure your online account. Unlike the PIN number that you use at cashpoint machines, you should choose a different password for each of the websites you give your personal details to. Security is very important when making any financial transaction online. It is also important to use a good password manager to track your passwords just in case you lose or forget one you need urgently. To ensure your online accounts are as secure as they can be, it’s important to create what is called a strong password. Security in the world of password is defined as weak or strong. The former are passwords that are easy to crack, with the later being much more difficult and therefore, offering the user a higher degree of security with their personal data. Often you will be limited to the number of letters, words or symbols that your password can contain, but passwords are usually at least six characters long. The longer you can make your password the better, but of course the more characters is has, the more difficult it can be to remember. Many websites will show you the strength of your password when you create it. Anyone trying to crack your password security will first try any of the personal information they have about you. Your address, birth date or phone number are all easily located. Try and avoid using any of your personal details in your password. Many of the password cracking software applications will look for proper words, so try and avoid these. If the website you are using allows this use a mixture of letters, numbers and other characters you can access via your keyboard. One of the most secure passwords you can create is via a pass phrase. You think of a phrase that is memorable. An example would be ‘I like to buy books from Amazon as it is fast and easy’. This would translate into a password that reads: ‘il2bbfAaisf&e’. 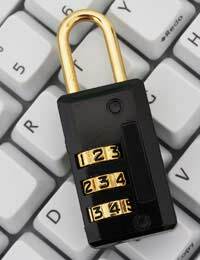 Password security can be greatly enhanced if you change your passwords regularly. If you can get into the habit of changing the passwords you use most often between 30 and 60 days, your password security will be very strong indeed. It is very easy to simply use the same password on all of your online accounts. The disadvantage is that if you password is cracked, all of your accounts can then be accessed. Having a different password for each account minimised your security exposure. One tried and tested method of creating a secure password is to use a base password that you annotate to make it unique for whatever website you are accessing. For instance, you could choose a base phrase that is the initial letters of your favourite song. If this is A Rush of Blood to the Head by Coldplay, your base password would be ARoBttH. You then add characters to make the password unique to the website you want access to. If this is Amazon, your new password would be ARoBttHAM. You can also include additional characters if the website allows this such as £,$,% or any other character on your keyboard. Generating a new password and also recovering a lost password are difficult tasks to complete. The good news is that there are many software applications and websites that can help you create strong passwords that can then be included on a database you can consult if you forget a password you need. Password security is only as good as the password you choose. You can use one of the techniques already covered to generate your own unique passwords, or you can use software to do this for you. Services like My Password Generator and RoboForm are good examples. ?Generating new passwords is only half of a good password security system. As you create more passwords, managing them becomes an important issue to address. A lost password can be very frustrating. One of the best ways to manage your growing list of passwords and to give you a chance of password recovery if you forget a password is to use password management tools like robohelp.